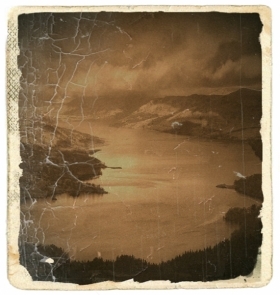 "Long afore ony steamer was put on Loch Katrine, there was a ferry-boat, the "Water-Witch", a bonnie muckle thing it was, rowed by eight bonnie kilted lads like mysel', that brought a blush tae the cheek o’ many a fine city lady takin’ in the sights. There being nae road twixt Coalbarns, where the galley moored, an’ Inversnaid, where oor guests wad bide, the boatmen had tae carry their luggage five full miles on their backs. The lassies, sittin on’ ony o’ thirty ponies set aside for comfort, smiled at that, too. Wae thistles, nettles an’ midgies infestin’ the flutterin’ folds o’ their filibegs, I’m no’ sure the boys were smilin’ back. 'Twas ‘Gypsy’ – the iron steamer that turned up here in the summer o’ 1843. Eight horse-power it had....an’ a’ that might dedicated tae gie us an’ our thirty ponies a run for oor money! Jamie Stewart, oot Callander way, he had the worth o’ it. To run from Coalbarns to Lochend." From there to sail upon dry land. They got the boat put up on carts. Surrounded by a host of men. Two days frae Stirling tae Callander. Good goin’, I’m sure ye’ll agree. After that...well....it took a wee bit longer than they expected. ‘Twixt the Tollhouse an’ Kilmahog a wagon-wheel splintered an’ sank intae the bog – carriages an’ carts clutterin’ up the road behin’ them. An’ you thought traffic-jams an 'congestion' were modern inventions! That was unlucky! An' some started sayin' as how the great iron beast was curs'd! 'By seventeen the old was chosen. The new by only half-a-dozen. They left the harbour side by side. Were seen in every rower's face. Their little vessel onward flew. They thought upon their oars with pride. Their passengers for to amuse. The vessel that they left behind. As from their blades the spray they fling. That said...the boys were knackered. I’m no’ sure they cou’d hae kept up the pace for long. But, after a week or so, the strangest thing happened. The ‘Gypsy’ disappeared in the middle o’ the night. A mystery, sure enough. Perhaps a that talk o' a Curse was true, after a'! His honour the Fiscal – a fine gentleman – oh, he was havin none o' that superstitious talk. He paid several visits tae the Loch, but failed tae procure any reliable information as tae what had befallen the poor 'Gypsy'. One by one the crew o’ the ‘Water Witch’ were summoned, but – an’ here’s a funny thing – while each cou’d converse in tolerably good English wae their passengers , as soon they entered the Court-house at Dunblane, an’ were asked afore God if they had scuttled the steamer they cou’d only speak in Gaelic. Understandable...it is an honest language, after a’. An’ was it no’ a shame that the interpreter the Sheriff hired tae take their testimony struggled tae understand them. ‘Course, while they pointed fingers at the crew o’ the ‘Water Witch’, the owners o’ the ‘Gypsy’ mocked the quite reasonable explanation offered by the boatmen: that it was the magical Water Bull, that swims these waters – and, they say, sires the hardiest calves amongst the local herds – which had holed the steamer wae its mighty horns. The beastie, after a’ was protective o’ the galleys, an’ may hae ta’en fright at the clatter an’ clamour o’ the ‘Gypsy’s engines. The story was ‘bull’, right enough, the Fiscal said...just no’ in the way the boatmen claimed. ‘Course, the followin’ year the ‘Rob Roy’ arrived – a’ thirty tonnes o’ her – an’ the Witch’s days were numbered. Then came this pretty wee boat. Sure, it would be an awfy shame if someone sawed a hole in her keel... Still, accidents do happen."